Haseko Corporation has made it a social mission to create an environment that is optimal for cities and people. With the belief that creation of a truly rich environment can be achieved only after we realize a society that preserves the global environment and can develop in a sustainable manner, the Company operates activities in pursuit of preserving and improving the global environment in a better way. Specifically, Haseko has established its envronmental policy as a company and acquired ISO 14001 certification. Each business unit implements environmental preservation activities by setting specific objectives including reduction of construction waste and promotion of recycling. Moreover, our internal audit and external review are being executed on a regular basis to realize continual improvements. Since 2007, Haseko has been holding the annual “Haseko Living Design Competition” for students, with the aim of fostering young people who wish to work in the world of architecture. The fifth competition held in 2011 set the theme of “the richness of reuniting to live together,” and attracted many proposals about condominiums and rental apartments that would reevaluate the value and richness of living together, while taking into account such key concepts as community, networks, energy saving and sustainable buildings. A total of 501 proposals were submitted from 1,095 registrants, awarding one proposal with first prize, two proposals with awards of excellence, and seven proposals with honorable piece of work. Haseko Community, Haseko Smile Community and Haseko Community Kyushu implemented the “Mission Uchimizu (Water Sprinkling) at Condominiums 2011” from July 23 to August 23, 2011. 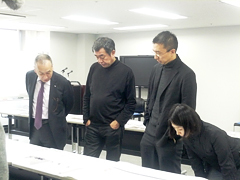 The objective of the Mission was to support the creation of enriched communities by residents of condominiums for which the Haseko Group is entrusted with management. The number of participants has been increasing year-by-year, and increasing numbers of unit owners' associations have established the initiative as a regular event. Since the Mission started in 2008, the accumulated number of participating households has reached 100,000. 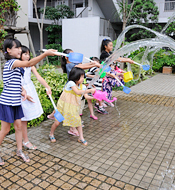 In 2011, 50,923 households from 999 condominiums participated in the initiative, and implemented earth-friendly “uchimizu” by sprinkling secondary water utilizing leftover water from bathtubs and other available sources. An old tradition in Japan, it means sprinkling water on the streets, yards and other outdoor places. Sprinkled water vaporizes while using heat, leading to lowering the temperature. As such, water is sprinkled early in the morning or in the evening, especially in summer, for its cooling effects. 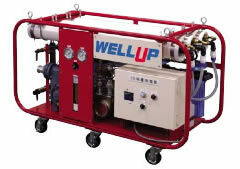 In recent years, people mainly use such secondary water around them as surplus water from baths or showers and rainwater, rather than tap water, for sprinkling because of environmental considerations. It is a project to promote water sprinkling and is implemented by the Mission Uchimizu Headquarters (part of Japan Water Forum, a specified non-profit organization), sponsored by the Ministry of the Environment, the Ministry of Land, Infrastructure, Transport and Tourism and other organizations. The participants sprinkle secondary water in tandem on selected dates. The project is conducted not only throughout Japan but also in such overseas cities as Stockholm and Paris. As an endeavor to counter the heat island effect and global warming in which people can casually and pleasingly participate, it serves as a “pump priming” to enlighten awareness of environmental issues. Immediately following the earthquake, Haseko established the Corporate Disaster Countermeasures Office at its headquarters in Shiba to collect information on such issues as the safety of employees of the Haseko Group, damage to properties under construction in the Tokyo metropolitan area, and damage to related facilities. As a result, Haseko confirmed that there was no impact on the fundamental performance of the structures, etc. of the properties that were under construction or ready for delivery in the Tokyo metropolitan area, which is the target business area for the Company. 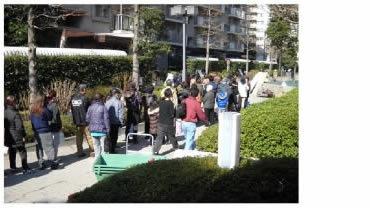 To support the affected areas, Haseko provided relief supplies, including 82 temporary toilets to Urayasu City, Chiba Prefecture, as well as making donations. 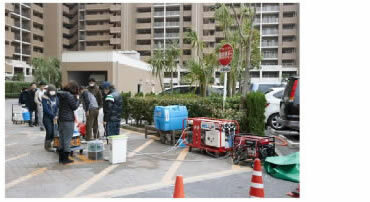 For condominiums in the Urayasu area, which had water outage due to liquefaction, the Company supported water supply by installing WELL UP, an emergency potable water generation system, among other measures. In addition, Urayasu Brighton Hotel, a Haseko Group company, provided its banquet halls and the lobby for lodging for approximately 150 people, including those who had difficulty returning home due to the earthquake, provided meals, and supplied bathing services for people in the neighborhood. In addition to its normal endeavors to reinforce buildings by incorporating seismic isolation structures and other measures, Haseko has accumulated research and development information on how people’s lives would be following major earthquakes or other disasters. Since 2003, the Company has been proposing the installation of “three-piece set disaster prevention equipment” as the “emergency lifeline” for securing the living foundations of residents. 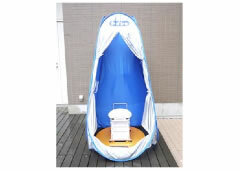 The “three-piece set disaster prevention equipment” is comprised of the following three items that Haseko developed, based on customer questionnaires and other sources, as equipment needed in times of emergency. This system digs wells on sites where it is installed and generates emergency potable water for up to 4,800 people a day. Installed in the condominium site, the bench can be used as a cooking stove just by removing the sitting board in times of emergency. 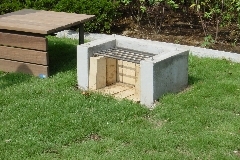 These are temporary toilets that can be easily prepared by remov- ing sewer system manhole covers on the condominium site.